Here is the complete review of the brilliant and bold racquet from Prince called the Prince Phantom Pro 100P. Something as rare these days as a flexible players’ racquet. The Prince Phantom Pro 100P comes in a setup feating a box beam, razor-thin CTS beam which goes from a thin 16mm in the shaft (for feel) to a thicker 20mm in the head (for power) listed as 59 RA. No matter what the performance of the racquet, you really have to commend Prince on releasing such a flexible racquet in a time where power and dampening of shock seems to be the only marketing methods. Comparing the Phantom Pro 100P to the Phantom is easy, since the traditional Prince Phantom has the unique Prince ports system that makes for a uniquely flexible feel that is definitely not for everyone. The Phantom Pro still possesses that thin beam and nice feel, but without the ports which gives a bit more direct feedback. Something I personally prefer. 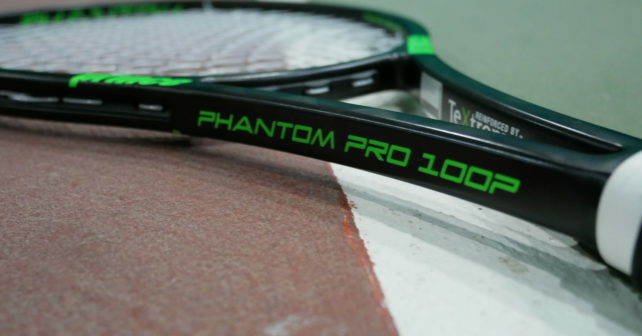 The other Phantom Pro has an even more flexible than the 100P and lower static weight and swing weight which means lower power (but also stability), other than that there’s not much separating the two Phantom Pro racquets. If you want to compare the Prince Phantom Pro 100P to its predecessor, the Prince Textreme Tour 100P ’s, the Tour 100P has a more traditional 22.5mm / 23.5mm / 21mm beam. Also, the RA of the new Phantom Pro 100P is three points lower (RA 59 compared to the Tour 100P with RA 62). What Prince also has done for the Textreme Phantom Pro 100P is to increase the swing weight from the 100P’s 321 to 329 which I think is a move in the right direction since for a lot of players it won’t need lead tape to play stable. I’m usually not a fan of 100 sq inch racquets, but the control and feel of the Prince Phantom Pro 100P is exceptional and despite that the power level is not bad. It must be thanks to the CTS beam that allows the racquet to be bit thicker up in the hoop for more power. It can’t rival a power machine such as the Babolat Pure Drive Tour Plus (read and watch my review here). Below is the video review of the Prince Phantom Pro 100P. This is a racquet that plays great from all areas of the court and I especially like it on the one-handed backhand. I usually feel that 100 sq inch racquets are a bit cumbersome to use for that wing, but here I appreciated the large-sized sweet spot. It actually took me a longer time to dial in the forehand, possibly because I’ve been playing so much with spin-friendly frames such as Angell K7 Red and Babolat Pure Drive Tour Plus where it’s ridiculously easy to generate spin. The Prince Phantom Pro 100P is not bad in the spin department, but I somehow expected more RPMs on the ball on my shots which made me hit my forehand on the tape of the net a number of times before I managed to dial it in. The thin beam really makes slice and drop shots a pure joy to hit. It almost felt like a Wilson Pro Staff 85 but with 15 extra sq inches! This makes me believe this racquet is perfect for someone with a cunning all-court game that is not all about pace or spin. You can really move the ball around easily and “craft the point” with this racquet. Why not mix it up with different spins, hit a drop shot, move to the net and finish the point? What really surprised me was that it worked really well on my serve without any practice. It wasn’t as much of a serve monster as the Babolat Pure Drive Tour Plus , but it was easy to get some good swing speed and placement consistency. I enjoyed htiting a racquet below 350 grams which is where I usually end up after lead-taping my racquets. It really helped my swing speed and makes me wonder whether I should really play with racquets around 353 grams when there are stable, lower-weight options on the market. As you can hear I really enjoyed playing with the Prince Phantom Pro 100P, but it didn’t really win me over a hundred percent as a racquet I would switch to and it’s not easy to pinpoint why. The round-ish head-shape irked me a bit, but it shouldn’t be a big deal. I think I just enjoy the Angell K7 Red a bit more on ground strokes and for the extra spin and noticeable flex it gives me. It can also be because I’m so much looking forward to the baby brother of the Phantom Pro 100P – the Phantom pro 93P. If that frame shares the characteristics of this racquet in a smaller head size, it will be hard for me to resist! I didn’t feel this racquet was in any way or form string sensitive or needed any lead tape to play well. Both poly and multifilament strings should play fine in this racquet. Buy it, string it up and get on the court and work on your game. Just a no BS racquet with great playability. Well done Prince for sticking your guns with comfortable, player-friendly tennis racquets in a time of power and stiffness. I hope you keep doing this for many years to come. Are you intrigued by the Prince Phantom Pro 100P? If so, why? If not, why? It is softer than Babolat pure aero? Searching for some new rackets with little more control and weight than pure aero. Yes, it is much more comfortable. It is quite different in feel, but it’s definitely worth a try for you if you’re looking for control and comfort! I have a Yonex SV 98, but I´m really concerned about my shoulders. Do you think it’s worth changing form my SV 98 to a Prince Textreme Tour P, or just reduce the string tension of my SV 98 to 48 lb (today I use 53). Yes, the Yonex SV 98 is a stiff racquet. The Tour P or Pro 100P are more comfortable racquets for sure, but 100 sq inches compared to 98, not sure if that matters for you. I definitely think playing with softer racquets is generally a good idea, especially if you are worried, or suffer in some form from, arm/wrist/elbow pain. But if you really like how you play with your SV 98 you could start with going down in tension and if that doesn’t help, trying a softer string. I think a lot of players these days play with poly strings although a good multifilament or even natural gut would play much softer and still won’t give them so much less spin. What’s the difference between Phantom pro 100 and 100P? The Pro 100 has a tapered beam, lower swing weight, and an even lower stiffness (RA 54! ), while the Phantom Pro 100P has box CTS beam (from 16 to 20 mm) and swings heavier at a 329 swing weight. They play close but the Pro 100P is a little beefier and more stable, while the Pro 100 swings a little faster. Two nice racquets from Prince. Enjoy your site and reviews! I have recently picked up tricep tendonitis when playing with a full poly on my Head Youtek Speed mp. I have tried a hybrid setup, but I can still feel the pain in my elbow/triceps after back-to-back hitting sessions. I’m therefore considering switching to either a Prince Tour 95 or the Phantom 100p due to its lower flex. I cannot demo Prince rackets in my country Denmark, so I need a final advice on which to buy. I’m 27yrs old playing team matches, and plays as an aggressive baseliner being able to generate pace on my own. Shame to hear about your injury! 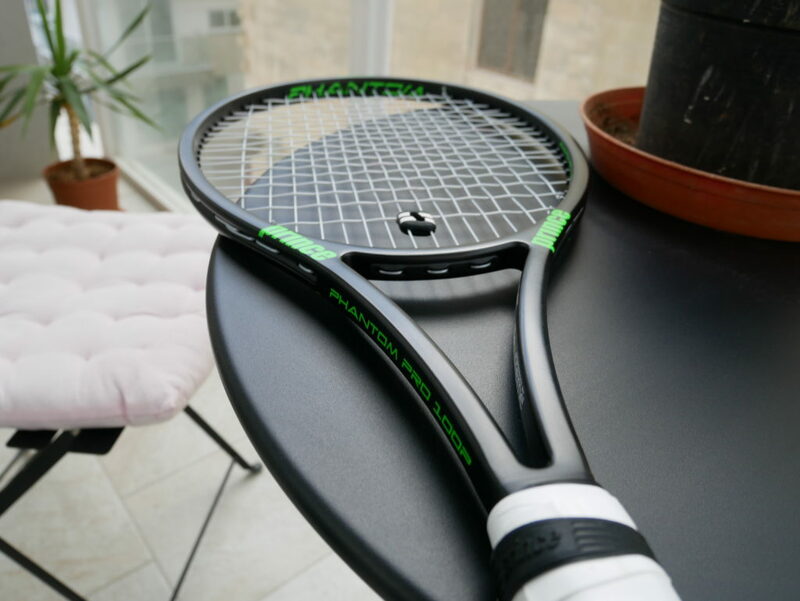 But the Speed MP is quite a stiff racquet and in stock form relatively unstable so I think you will have a great time with the flexible and stable Phantom Pro 100P. The Tour 95 is a nice racquet too, but might be too low-powered I think. Thanks for the great review. What strings and tension did you use for the review ? After the review, would you stick with the same string setup if you continued to play with it ? If not, what string setup changes would you make ? I used Luxilon Alu Power, which I liked, and Solinco Hyper-G which I also liked, both strung around 22-23 kg. Since the racquet is comfortable it can handle a poly and I got a bit more bite from the Hyper-G. Besides, looks great in the black frame! This great review led me to a buy the Phantom. I love it for the control, i had it strung with 25 Kg tension and with a soft string, and guess that is way to much? I struggle to returning big serves, and have to make full swings a specially on my onehanded backhand, that leads to more errors on the backhand, do you think that 23 Kg tension will easy up the onehanded swing? I think 25 kg is too high for the Phantom, try going 22 kg. Even 20 kg could work in that racquet if you string with polyester strings. If you need more mass and stability, try adding 2 grams of lead tape at 12 o’ clock or 4 grams at 3 and 9 o’clock. Now it feels almost perfect! Hi, grew up playing Wilson Pro-staff’s 85, and 95 6.1 classics. They are serve and volley weapons! But getting older and looking for larger sweet-spot and a bit more power on tap. Currently using a Yonex DR 98, which is a great all-round racket, but never liked it on serves compared to the older Wilson pro-staffs. I think the thin beams make it easier for top-spin serves. I tried the RF autograph, and its a great racket, but two heavy to play five sets with. Would you say this Prince Phantom Pro 100p is the closest modern interpretation of the older Wilson Pro-Staffs available today? Great website and YT channel by the way! Regards from Eden island, Sey. My Head Speed pro/mp adventure that lasted only 2 months is finished. Both my arm and my hitting pleasure found them too stiff. I just ordered 2 new sticks; a Prince Phantom Pro 100P and a Tour Clash. I plan to string them 17 vs gut 22 kg/ 17 4G 20 kg. Any advice? I wander which one will suit me..? And if these 2 fail what would be my hope? Hope you’re enjoying Eden Island! Yes, the Speed Pro can be stiff to some. The Phantom Pro and Tour Clash will be interesting to test for you. I like both racquets. The Clash will be easier to use, but the feel is not for everyone. I would probably string the Clash a little bit higher if I were you, otherwise the setup sounds spot on. Start with these and let me know what you don’t like or like and we’ll take it from there. I replaced the leather grip with a synthetic grip on the RF autograph, and the setup for me is now perfect! Weighs in under 250g strung weight, and still head light enough.